GNOME 3.16 Might Just Be The Best Version Yet - OMG! Ubuntu! The last few releases of the GNOME desktop have been fantastic, haven’t they? GNOME devs seem to be able to balance the need for new features and technologies with consistent design finesse, needed bug fixes and overall usability refinement. 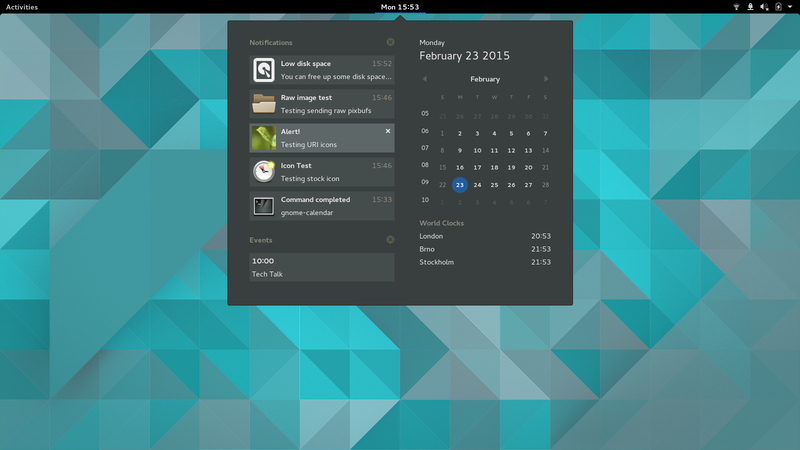 Next month’s GNOME 3.16 release due March 25, shows no sign of being any different. GNOME developer Matthias Clasen recently shared GNOME 3.16 screenshots on his blog to show off some of the progress made this cycle. And it’s fair to say that things are looking great. The main GNOME Shell theme has been rewritten to share more code with the default Adwaita GTK+ theme, notifications have been redesigned and now appear at the top of the screen. The old bottom-based ‘message tray’ that require all sorts of mouse aerobics to reveal has been removed. Notifications are now ‘housed’ in the Calendar pop-over menu. GNOME has always been a proponent of keeping things simple. The clean, deliciously straightforward privacy controls added to the System Setup walkthrough are a good example of this, letting you quickly opt out of bug reporting and geolocation tracking before you use your desktop. GNOME’s privacy settings can be accessed and changed at any time from the GNOME Control Center > Privacy pane. Nautilus (aka ‘Files’, the GNOME file manager) gets additional interface attention in GNOME 3.16. The ‘gear menu’ introduced in an earlier revision has been restyled as a popover, the appearance of files in ‘list’ view has been improved and you’ll now be able to quickly undo deleting a file thanks to a new post-delete notification. Look out for a strange dashed line in the sidebar column when content sits above the current scroll point. Other applications have received a refresh, including a more streamlined version of the dependable Eye of GNOME image viewer. There is also a small selection of new app previews being rolled in, including a sliding tile puzzle game, revamped character picker and the debut release of a brand new GNOME Calendar utility. Are you excited for GNOME 3.16? Are you already using beta builds on a Fedora or Arch install? Let us know your thoughts in the comments below.